We can provide everything from introductory to advanced and expert level training. Based on your previous experience and knowledge we can create a course to take you higher than ever before. 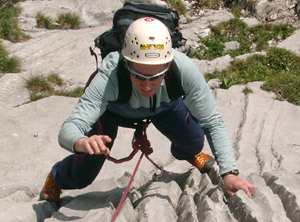 Introduction: Basic ropes, knots, and techniques with belaying , rapelling, and movement on rock. The perfect first time experience. Mastering Movement: Practice your movement skills by climbing exiting routes and through challenging terrain. Learn to lead: Introduction to lead climbing techniques and strategies to take you higher. Here the focus is on single pitch climbing protection strategies on bolt protected climbs and advanced belay techniques. Single pitch rescue essentials are also introduced. Learn to Lead on gear: For climbers experienced with lead climbing on bolt protected routes. This course is for those looking to learn the craft of traditional climbing, anchor building and protection placement with protection pieces such as Nuts, Cams and Hexs. Multi Pitch Climber: Learn the essentials of multi pitch climbing. Movement and belay strategies are covered as well as anchor building and rappelling. Rock Rescue: A must do course for all experienced climbers looking to do more on their own. Learn the skills and techniques to get yourself and your climbing partner out of a sticky situation safely. Learn techniques for evacuation rappels, weight transfers for multi pitch rappels, rope ascending, lowers, raises and more. Advanced Rock Course and/or private guided ascents like Chinaman’s Peak, Tower of Babel, Grassi Ridge, Grand Sentinel, or Bugaboo rock climbs can be arranged on a request basis.